A lot of statements get made regarding how long various brands of lump charcoal burn and how much ash they produce. We decided to conduct a semi-scientific examination of these questions by performing test burns of some representative brands of lump charcoal, as well as Kingsford briquettes. The following table shows the brands of lump charcoal tested and why they were selected for testing. Basically, we chose brands that were 1) available AND 2) representative of different types of lump charcoal. We also decided to include Kingsford briquettes since we so often see questions asking how does lump charcoal compare to Kingsford. However, it was not our intent to compare specific brands. Rather, we were attempting to compare 5 different types of charcoal. As we stated in the Introduction, this was a semi-scientific examination of these charcoals. We didn't used a closed system calorimeter. (But then, we don't cook in a closed-system calorimeter, do we?) A small Big Green Egg ceramic cooker was used for all test burns. The cooker was disassembled and cleaned before each burn. 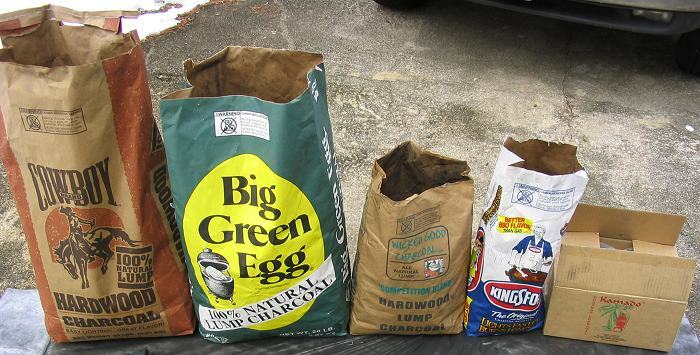 We measured out a fixed amount (5 pounds, 14.75 ounces) of each brand of charcoal. (The reason for that particular peculiar weight was that we tested the Kamado lump first and this weight was as close to 6 pounds as we could get without cutting pieces.) The clock was started when the lump was burning steadily and the temperature of the cooker reached 400 degrees. We tried to keep the temperature of the burn roughly the same for each brand (around 450 degrees), but of course there were variations. We also could not control the outside temperature, but of course, cooking in a ceramic cooker reduced the effect that the air temperature had on the burn times. (We include temperature, dew point and wind charts, as well as a photo showing the phase of the moon for each test if you find this information helpful.) As the burn progressed, we did whatever was necessary to keep the cooker at 450 degrees. Hence, we stirred or poked the lump as needed to dislodge ash. Towards the end of the burn, we opened the top vent more and more to keep the temperature up. We also moved charcoal to keep it piled up once the charcoal had burned down to a few pieces. The goal was to see how long the charcoal burned, not how long it would burn unattended. We allowed the burn to continue until the temperature of the cooker dropped to 300 degrees. At this point we stopped the timer. We then allowed the charcoal to burn completely to ash and then to cool. At that point we weighed the resulting ash and measured its volume. While we couldn't/didn't keep all factors precisely controlled, we stress that the purpose of this test is to provide data for comparison purposes. We didn't try to produce data that says X pounds of Brand Y will burn for Z hours. Rather you should be able to conclude that Brand A will burn for about 1.5 times as long as Brand B and produce three-quarters the amount of ash. We chose Kamado Extruded Coconut Charcoal because of the claims of it being ashless and long burning. We wanted to test this charcoal as being representative of extruded charcoal types. The test burn was conducted on January 15, 2004. 13 pieces of lump were lit in a chimney starter with 7.5 sheets of newspaper. Once the lump was beginning to burn with a small flame, it was dumped into the cooker on top of the rest of the lump sample and evenly spread over the top. As soon as the temperature rose to 400 degrees, the timer was started. The temperature rose to 450 degrees where we stabilized it. Air temperature was 45 degrees when the burn started, 40 when it finished, with a high of 50 degrees during the day. The ash was relatively "fluffy", a scientific term. To measure the volume, we gave it a mild shake to level it in the measuring container, but we didn't try to shake it to reduce the volume. Temperature, dew point and wind speed readings during Kamado test burn. This lump is actually made by Royal Oak. We chose to include this brand of lump in the test as it is representative of the many brands of hardwood lump charcoals sold in America. The test burn was conducted on January 2, 2004. All of the charcoal sample was placed in the cooker and lit with 2 pieces of parafin/sawdust starter. (The sample filled the cooker to an extent that we don't think we could have safely dumped a quantity of burning lump from a chimney starter onto the pile of lump in the cooker.) The timer was started when the starter burned out and the temperature reached 200 degrees. The temperature rose and was stabilized at 450 degrees. The air temperature was 64 degrees when we started, 54 when we finished and the high during the day was 65 degrees. The ash was typical of wood ash, fairly fine-grained. The measuring container was shaken just enough to level the ash for measuring. Big Green Egg test burn. Temperature, dew point and wind speed readings during BGE (Royal Oak) test burn. This lump was chosen as being representative of the scrap lumber charcoals being sold in America. Also, there have been many claims made on bulletin boards that Cowboy is less dense and burns hotter and faster than other natural hardwood lump charcoals. The test burn was conducted on January 3, 2004. Most of the charcoal sample was placed in the cooker. About 1 pound of the sample would not fit. (Cowboy charcoal is less dense than many other brands of charcoal and occupied more volume.) The charcoal was lit with 2 pieces of parafin/sawdust starter. (The sample filled the cooker to an extent that we don't think we could have safely dumped a quantity of burning lump from a chimney starter onto the pile of lump in the cooker.) The timer was started when the starter burned out and the temperature reached 500 degrees. (Cowboy charcoal is pretty fast to light and get burning due to its lower density.) The temperature was stabilized at 450 degrees. The remainder of the test sample was added to the fire once it had burned down sufficiently. The air temperature was 46 degrees when we started, 65 when we finished and the high during the day was 72 degrees. Temperature, dew point and wind speed readings during Cowboy test burn. We chose to include this brand of lump because of its claims of being long burning. In addition, we chose this lump as being representative of charcoals that are starting to make their way to the US from South America. The test burn was conducted on January 17, 2004. All of the charcoal sample was placed in the cooker and started with 3 starter cubes. The temperature rose at a moderate pace to 400 degrees and timer was started. The fire was then stabilized at 450 degrees. The air temperature was 30 degrees when the burn started, 45 when we finished, with a high temperature of 50 degrees during the test burn. The ash was a very unique silky smooth on your hand, very fine and feathery. To measure the volume, we gave it a mild shake to level it in the measuring container, but we didn't try to shake it to reduce the volume. Wicked Good Charcoal test burn. Temperature, dew point and wind speed readings during Wicked Good Charcoal test burn. Aw shucks, why not? There have been lots of questions posted on BBQ forums asking for a comparison between lump charcoal and traditional briquette charcoal. Kingsford is certainly king of the briquettes and is a popular choice for use in metal cookers, so let's see how it compares to lump charcoals for length of burn and ash production. Incidentally, recent discussions on BBQ forums indicate that there is "domestic" Kingsford and "imported" Kingsford. According to the descriptions we have seen, the sample we tested is "domestic". It comes in a bag that does not contain a plastic liner, and the individual briquettes have a "K" molded into them. The test burn was conducted on January 4, 2004. Most of the charcoal sample was placed in the cooker. About 1.5 pounds of briquettes was placed in a chimney starter. 4.5 sheets of newspaper were used to get the charcoal burning adequately. This charcoal was dumped into the cooker on top of the rest of the charcoal and evenly distributed. The temperature rose at a moderate pace to 500 so the timer was started shortly after the lit briquettes were added to the cooker. The fire was then stabilized at 450 degrees. Significant "ash control" was executed during the burn to keep the fire going. The air temperature was 64 degrees when the burn started, 71 when we finished, with a high temperature of 71 degrees during the test burn. The ash was relatively granular. To measure the volume, we gave it a mild shake to level it in the measuring container, but we didn't try to shake it to reduce the volume. Temperature, dew point and wind speed readings during Kingsford test burn. We didn't perform any actual measurement of density of the various types of charcoal, but it was obvious that there was a difference as we measured out the equal weights of each charcoal for its test burn. For what it is worth, here is a side by side photo comparison of the five types of charcoal. Each sample is 1 pound, 15.75 ounces. They are arranged left to right in order of decreasing volume, and hence, increasing density. Equal weights of the five types of charcoal tested, side by side. This chart shows the burn times for 5 pounds, 14.75 ounces of each type of charcoal. Burn times for equal weights of each type of charcoal. This chart shows the burn times per pound for each type of charcoal. This chart shows the burn time for an arbitrary volume of charcoal. What arbitrary volume did we use, since we didn't do an actual measurement of density? The number of small trashcans it took to hold the burn sample of each charcoal. Yes, a rough measurement, but good enough to use in comparing one type with another. And why might this be important? For long cooks where you need large amounts of charcoal, you may find yourself running out of room to hold all the charcoal you need. It doesn't do any good to know that 6 pounds of Brand X charcoal will burn Y hours if your cooker won't hold 6 pounds of Brand X to begin with. The following chart has no units, unless you want to use "hours per trash can". But the way to interpret this chart is that larger numbers are better, i.e., more hours for the same volume of charcoal. Burn times for equal volumes of each type of charcoal. Weight of ash produced by each type of charcoal. Volume of ash produced by each type of charcoal. Results - Weight Of Ash Produced Per Hour. Weight of ash produced by each type of charcoal per hour of burn time. Volume of ash produced by each type of charcoal per hour of burn time. How Each Type Of Charcoal Ranked In Each Category. There was no surprise in the fact that Wicked Good Charcoal's Competition Blend and Kamado's Extruded Coconut charcoal burned the longest times. After all, both types of charcoal are dense and have a high fixed carbon content. What was surprising (at least if you read some of the barbecue forums) is that Cowboy charcoal burned as long as Big Green Egg/Royal Oak charcoal. We've read dozens of times that "Cowboy burns hotter and faster and won't last as long." This misperception is probably due to the fact that people are comparing equal volumes of Cowboy and other brands, not equal weight. Perhaps the greatest surprise of all though, was Cowboy taking home number 1 in the ash category. Cowboy lump produced the least amount of ash, both in weight and volume. Who'da thunk it? So, if you want long burn time and low ash production, it's pretty clear that Wicked Good Charcoal Competition Blend and Kamado Extruded Coconut charcoal are good choices. Whatever your goals, we hope this data helps you sort out some of the characteristics of the different types of lump charcoal and Kingsford briquettes.